I like meat. Do you? Cut the vegetables into pieces (about 1cm), fry it with a little oil and the rosemary. After the vegs cooled down a bit, knead them with about the half of the scrambled egg into the ground beef, and add some salt and pepper. Then, put the mass into the rolled puff pastry, use some of the remaining egg to glue the edges and coat the whole loaf. 1 hour by 180°C should do the trick in the oven. Enjoy your meal! Eva, a friend of mine from new zealand, continues blogging about raw food. Her creations look quite delicious to me, but it would be an even more delightful experience with some meat in it. That's at least my point of view. OK, I respect vegans. 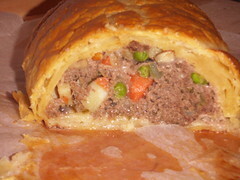 More meat for me :-) So, to counter the green waves comming over from NZ, here what was served last night at my table at home: Meat Loaf Wellington: The Recipe is acutally quite simple: 500g ground beef 1 carrot 1 onion 1 pole celery a handful of peas 4 wigs rosemary 1 egg a little olive oil puff pastry (about 30x50cm) Cut the vegetables into pieces (about 1cm), fry it with a little oil and the rosemary. After the vegs cooled down a bit, knead them with about the half of the scrambled egg into the ground beef, and add some salt and pepper. Then, put the mass into the rolled puff pastry, use some of the remaining egg to glue the edges and coat the whole loaf. 1 hour by 180°C should do the trick in the oven. Enjoy your meal!